the healthcare industry. by taking the same predictive analytics powered by dell technologies to diagnose their race cars... and applying it to the human body... mclaren can help healthcare professionals provide more personalized solutions, which could in turn support even speedier recoveries. ♪ (race car sounds) >> mike: portland by six with 11.4 remaining. okc will inbound. they have though go for the three. 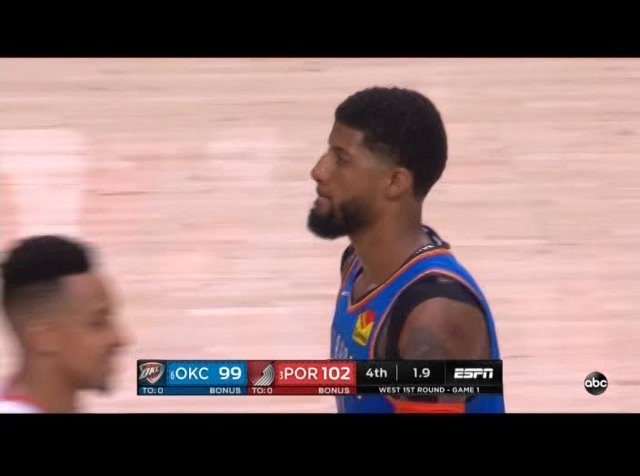 ferguson looks, finds paul george. george gefts a quick, clean look. knocks it down. three point game. >> jeff: a gamble by harkless. >> mike: turner, back to lillard. and a whistle. couldn't hear the whistle. turner was fouled. >> mark: you're talking about it, coach, bad gamble by harkless allowing paul george to step in. and a bad decision, had a chance to foul turner in the corner. he gives the ball up to an outstanding shooter in lillard. >> mike: i thought they called the foul initially. third best free throw shooter in the nba this year. he is 3 for 4 tonight. or today. calmly sinks that one. it makes it a four-point game. damian lillard, one of the clutch players in the nba. now 12 of his 28 points here in the fourth quarter. 5.5 remaining. okc with the ball when we come back. discover. hi, what's this social security alert? it's a free alert if we find your social security number on the dark web. good, cuz i'm a little worried about my information getting out. oh, why's that? [bird speaking] my social security number is... 8- 7- 5 dash okay, i see. [bird laughing] is that your daughter? no, it's a macaw. and his name is timothy. timmy, want a cracker? timmy, do you want a cracker? [bird speaking] what do you think, kevin? no. sign up online for free. discover social security alerts. how her father paved the way. 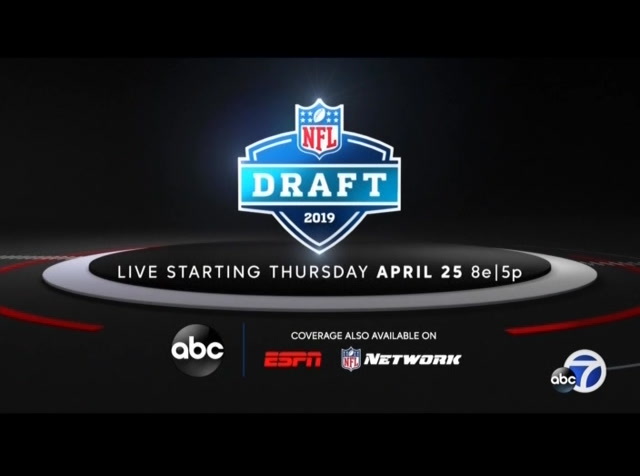 espn and the espn app. damian lillard, c.j. mccollum did their part. enes kanter, starting in place of nurkic. nurkic, the terrific young center for the blaze esch, broke his leg three weeks ago. 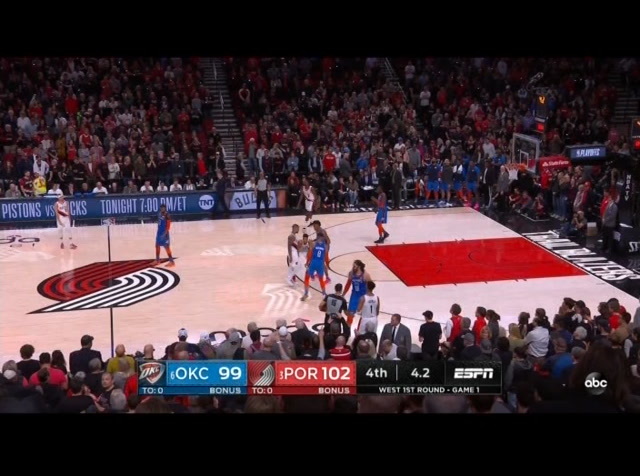 kanter filled in beautifully and made good defensive plays. signed him in february. damian lillard is certainly glad about that signing. 4.2 remaining. 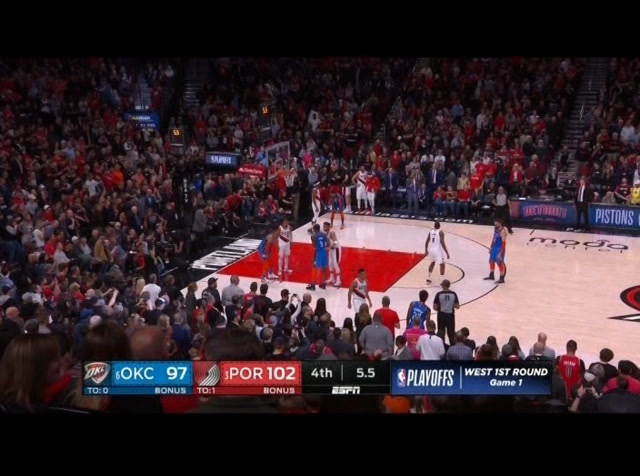 okc out of time-outs. >> mark: it's simple. 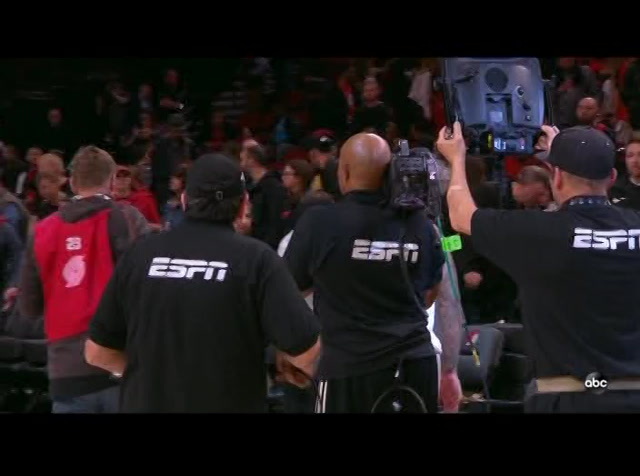 thap puft it -- the action, seth curry in the game because of the free throw shooting. >> mike: in the back court, dribbles away and paul george with 1.9 remaining. 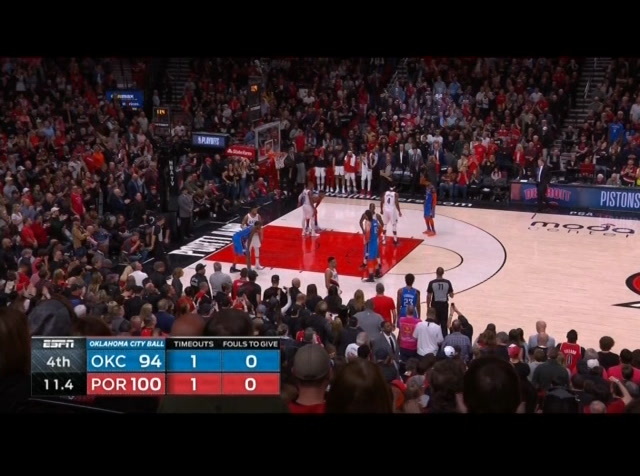 george has just fouled out and damian lillard could officially end it with a free throw. a spectacular fourth quarter. 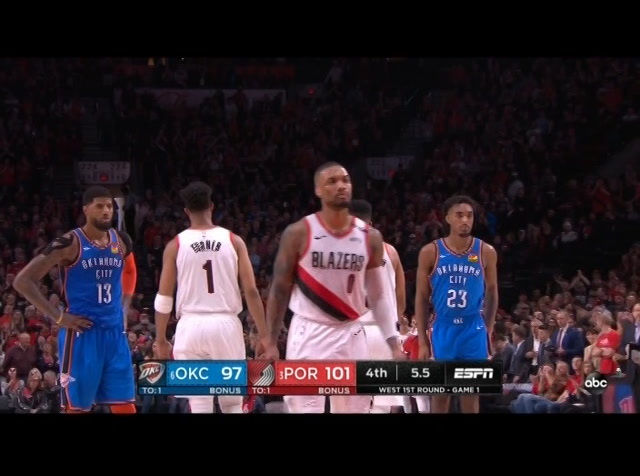 and portland takes game one. 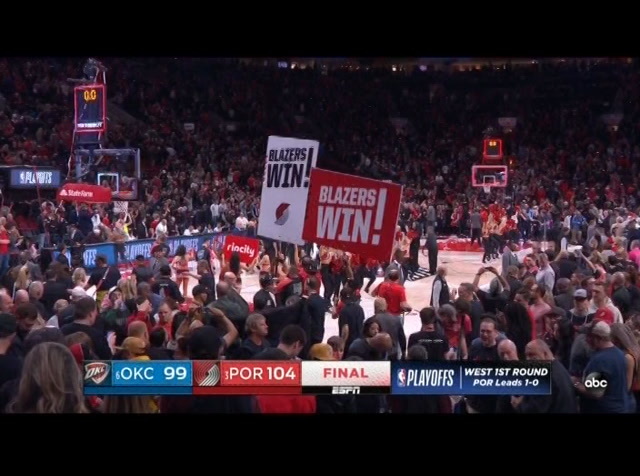 the blazers back in the win column in the nba playoffs. they led for all by 23 seconds. scary militari scary moments down the stretch. the blazers hold on and win it 104-99. game two coming up tuesday night right back here at the moda center. 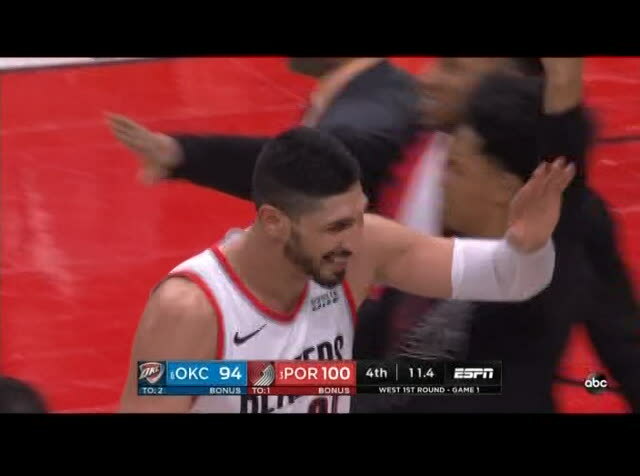 enes kanter, former okc thunder, really hurting his former teerm with his performance here this afternoon. lillard with 30 points, 14 in the fourth quarter. he's with lisa. >> lisa: thank you, mike. damian, first i want to ask you about one of your teammates. enes kanter going up against his former team. 18 rebounds today. 20 points. get that monkey off your back? >> it's great. get the monkey off your back. the past two seasons were sweeps. nobody wants to go through that. a lesser deem would have fallen after those experiences. and we were ready and we delivered the first play. >> greax on getting the first one. good luck the rest of the way. >> thank you. >> lisa: mike? >> mike: >> referee: of the lee players and premier leaders in the nba. they take game one as we finish up the second day of the 2019 nba playoffs. golden state winnings yesterday. houston, utah tonight. san antonio winning on the road beating denver. the playoffs off to a great start. c.j. mccollum, also a fine game. 24 points for mccollum. westbrook had a triple-double and the three point shooting hurting okc. for the producer and director, outstanding abc crew, for mark, jeff and lisa, mike breen saying coming up next is abc world newnew news. thanks for watching the nba on abc. . .
- [announcer] the following is a paid presentation brought to you by tristar products incorporated. - hey everybody it's emeril with huge news. 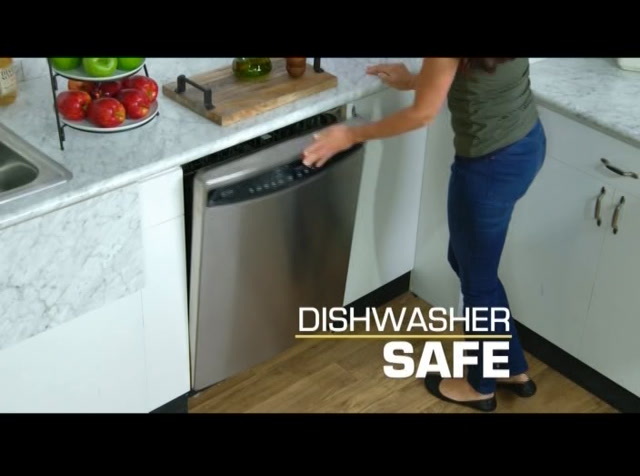 we're introducing an all new pro-grade appliance that now you can have at your home. so, get ready to kick it up notch. 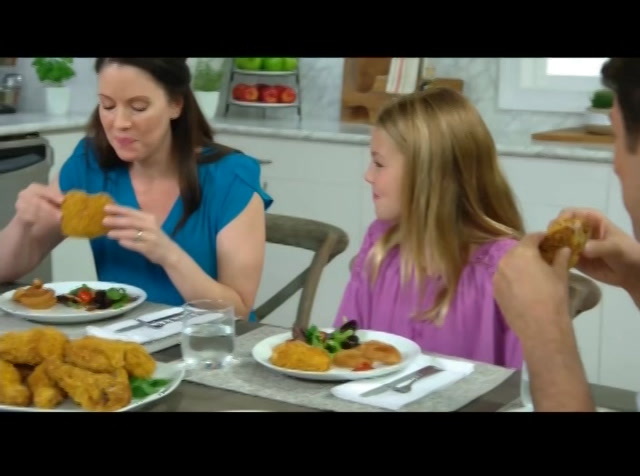 (cheering) - [announcer] we all loved fried foods, but we hate all the health problems that they can cause. what if you could make your favorite fried foods without so much of the unhealthy fat and calories. now you can. introducing emeril lagasse's all new power airfryer 360. the air fryer with quick cook turbo heat technology that fries with air, not oil, giving you delicious, crunchy, crispy results fast with up to 70% less calories from fat versus deep frying. 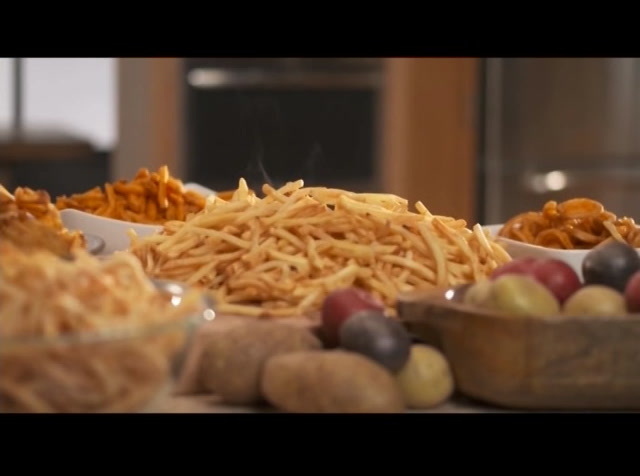 the airflow racks mean you can cook up to 450% more than a traditional air fryer. airfry steak and fries in 20 minutes. but with 12 cooking presets this is so much more than an air fryer. how crispy this chicken looks. - [kimberley] that is unreal. that means that you're getting up to 70% less calories from fat versus deep frying. - and folks, this is just one of the functions. we still have 11 more functions to go. that's how incredible the 360 is. and, - juicy, crispy, crunchy, air fried chicken - no oil, - no oil, i just have to say, this is really, really good. (cheering) look at that. - right, crab meat stuffed shrimp. look at the quantity folks. look at that. - look how beautiful those are. - right? so this is the competition. - [kimberley] alright. - [emeril] that's what you get. - alright, so this is a no brainer, this is a no brainer. not to mention, - where's the fries? - there's no fries, - where's the shrimp? - there's definitely not any shrimp. (laughing) - where's the chicken? - they're not in here. (cheering) (laughing) - [emeril] let me show you another function. - alright. - roasting. so watch this folks, that my friends is a 12 pound turkey. - the first thing i notice, chef, is the crispy brown, perfectly coed skin. - yes. - okay. - and what i wanna show you folks, the ease of the knife. oh yeah, look at the juices, look at that. i'm kinda drooling right now. - i'm definitely drooling. - [emeril] take a bit of that. - beautiful, thank you. - [emeril] tell me what you think. - so juicy, so flavorful. - so now i ask you, you ready to kick it up a notch? (cheering) now we're gonna slow cook. i took a pretty good sized pork, put about 7 pounds or so. after 8 hours, ah. - oh look at that. that's beautiful and look at that. four and a half quart pan, straight out of the oven. - [emeril] straight out of the oven. this is one of the most popular dishes that we have at merrill as well as emeril's coastal italian. - it's beautiful. - yeah, our next function is we're going to bake. and what we're gonna bake are these corn muffins. - how many people in our audience have a toaster oven on their counter, right? guess what, throw it away. (laughing) throw it away. we're toasting the top and the bottom and you don't have to flip it. - oh, look at that cheese. - look at that melted cheese. 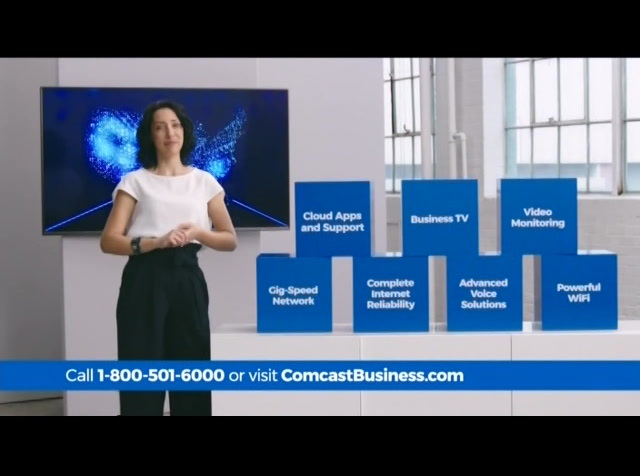 look, there's more. - have some onions. - oh wonderful. - [emeril] okay. - look at the thickness and the juiciness of these burgers. - oh this is not, these are no wimpy burger here. - [kimberley] right. - so look, we're gonna just build yours first and what i'm gonna do is i'm just gonna cut it and watch this, we stuffed the burger with cheese and then we added cheese on top of it. that's what i call a cheeseburger. - that is beautiful. - oh enough already, take a bite. (singing) ahhhh. - (singing) ahhhh. the hamburger gods are singing. - so now, that brings me to another thing. how bout dessert? (cheering) alright. (clapping) how do you guys feel about a chocolate molten cake? from fat versus deep frying. - [announcer] the secret is the five heating elements and smart fan with turbo blades that are angled to distribute the heat evenly throughout the entire cooking surface. air fry steak and fries in 20 minutes. 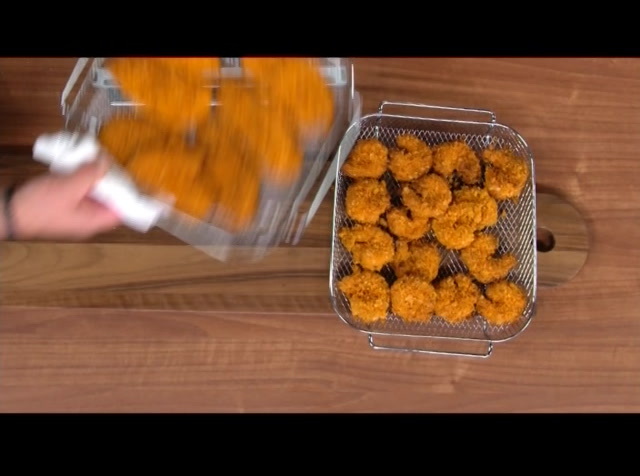 the airflow racks mean you can cook up to 450% more than in a traditional air fryer. - but wait, this is so much more than an air fryer. - [announcer] there are 12 cooking preset functions. one touch air fry rotisseries chicken, 30 minutes faster, that's so crispy on the outside and tender, juicy on the inside. one touch and you can roast an entire turkey, up to 40% faster and it converts into a counter top slow cooker. now you can braise pulled pork all day or slow cook ribs that are so tender they slip right off the bone. - look at this, oh my gosh. 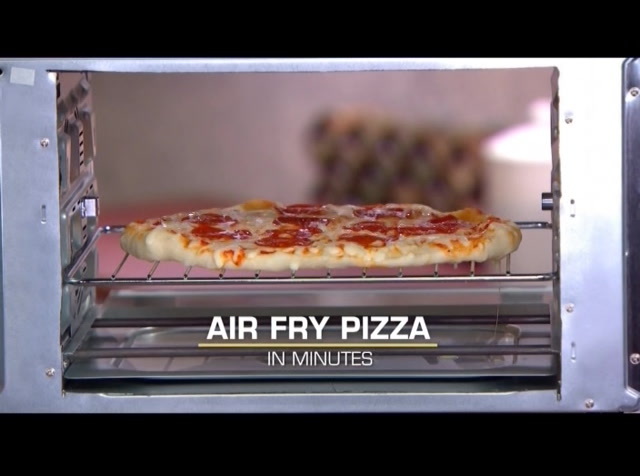 - [announcer] air fry pizza in minutes with perfect crust and sizzling hot toppings bursting with flavor. and can't even rotisserie. but you won't pay $400, not even $300. - call or go online now for my exclusive tv offer. 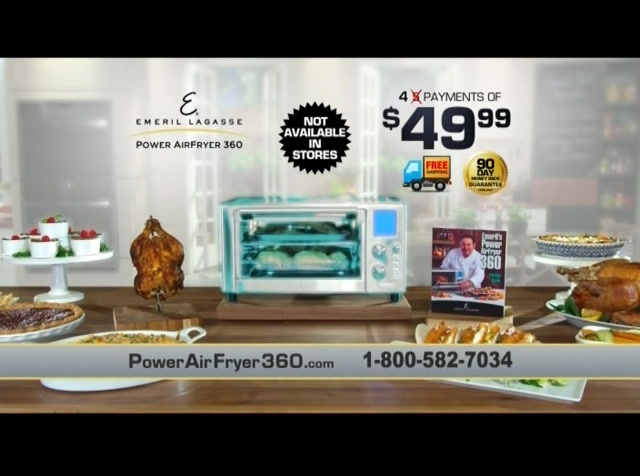 - [announcer] now you can get emeril's power air fry oven for just five payments of just 49.99. but wait, order now and we'll drop one payment. you'll get emeril's 360 for just four payments of 49.99. and there's more, bonus number one, the stainless steel airflow mesh basket, a $30 value. it's great for air frying and dehydrating. bonus number two, the stainless steel rack, great for toast and burgers. bonus number three, the roasting baking tray, perfect for roasting a whole 12 pound turkey and baking cookies. bonus number four, the rotisserie spit, to make restaurant style rotisserie chicken right in your own home. bonus number five, we'll also include emeril's recipe book, filled with his favorite recipes, just like the ones served in his restaurants. learn to make his tampino and sweet potato pecan pie. - and this deal gets even better, order right now, and i'll even ship it to you for free. 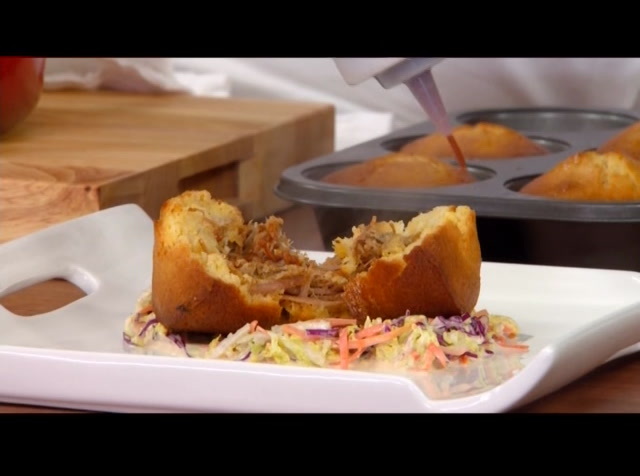 i'm so certain you're gonna love the power airfryer 360, i'm gonna let you try it in your home for 90 days. if you don't completely love it, send it back for a full refund, no questions asked. - [announcer] order now, this offer is not available in stores. you get emeril's power airfryer 360, the stainless mesh basket, airflow rack, roasting bake tray, rotisserie spit, emeril's recipe book and free shipping. this is valued at over $400. 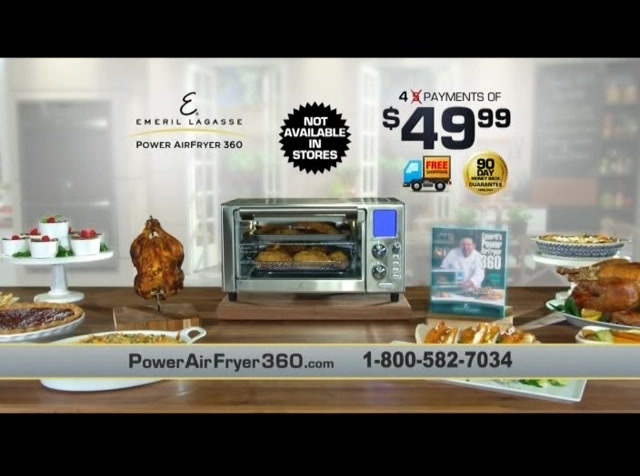 all yours, for just four payments of 49.99. this is an exclusive introductory tv offer you won't find in stores so call now or go to powerairfryer360.com to get yours. (upbeat music) - we're gonna do fish tacos. - yum. - and we're gonna have a party. (laughing) - let's have a party. - we're gonna use barbecue potato chips that we just sort of, just kind of crushed up like that. and then what you do, your fish, your shrimp, after you season them, we're gonna dredge 'em. and so what you have is a little different air frying breading. we got the beautiful shrimp. - [kimberley] look at those shrimp. - [emeril] we got our fish. today we're using beautiful flounder filets. - [kimberley] wow. - [emeril] and then we have our peppers and onions, that we roasted. - wow. - to me, that's not dinner, that's a party. (cheering) right, so now we'll give you a fish taco. we're talking up to two dozen tacos here. - [kimberley] that's a lot a tacos. - so here it is, from the air fryer, to you. - thank you. - okay, it's one touch, you walk away, yeah, right? (cheering) - so good. and we're gonna have crispy, wood fire oven quality results super fast. - kimberley is gonna show you how easy it is. kimberley's loading the appliance and look at this. by the push of a button, in that pizza setting, that's all you have to do and you have a perfectly cooked crispy pizza. - look at that. oh that's beautiful. 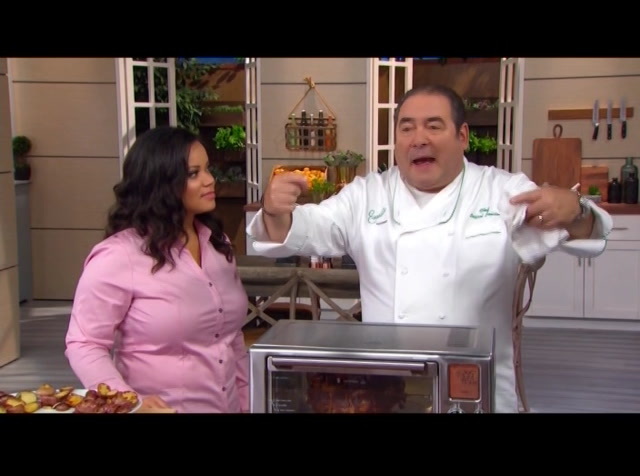 - [emeril] alright, so i'm gonna just do a little of that. - how crispy is it? - and let you be the judge. - mm, it's crispy and crunchy. i guarantee you're gonna wanna try this. - absolutely. let's come over here and let's show you the rotisserie function. this is a flank steak, i took my slicer right in half, so that i could just sort of butterfly it like that. just do layer of muenster cheese, because it gets really gooey, cheesy, it's not overpowering and then what i did was some roasted peppers in our air fryer mode. you could also buy 'em, but you'll save yourself a lot of money and then spinach that we blanched. now, you wanna make sure when you're rolling it that it's really tight, so watch. tight, tight. (laughing) tight! - you're locking in all those juices and all that flavor. - get this out. (gasping) right? - oh look at the juices dripping off of it. - [emeril] look at that. - wow, i have to say, this is beautiful. - [emeril] you should let it rest a little bit and then you start slicing. - [kimberley] oh look at that. - and folks what i wanna show you, check this out. (clapping) okay, beautiful right? in the air fryer we did some crispy onions. - mind you, these are air fried onion rings. - [emeril] correct. - [kimberley] no oil, okay. - just wait till you see how you taste that. all those flavors tied together.